Industrial handrail is all about personnel safety. Its focus is on fall protection. 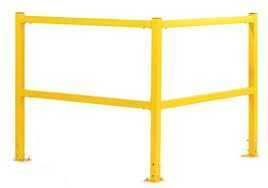 We can provide industrial handrail to meet any building code and OSHA fall protection requirements. Industrial handrails are used around mezzanines, stairs, ladders, building edges, docks, any place where a person might inadvertently fall off an edge. Industrial handrail is also utilized to define walk areas and work cells, but would not survive an impact by an industrial truck. Its primary purpose is to prevent falls. CSI provides industrial handrail for any application where handrail is OSHA mandated or it makes since to enhance employee safety. We also offer Wire Mesh Panels, Machine Guarding, additional rack safety items, Guard Rail, and other safety & security equipment.